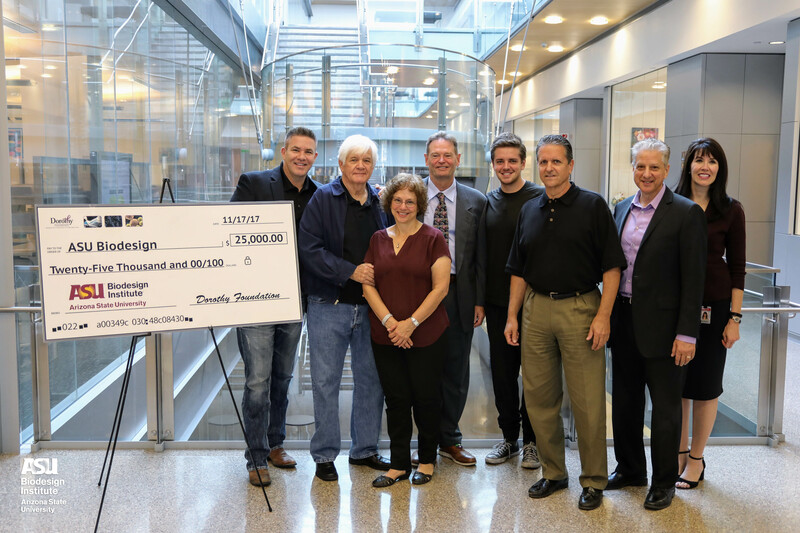 The Dorothy Foundation presented the check at the Biodesign Institute on Friday. (From left) Jude LaCava, Sandra LaCava and Stephen Johnston at the Biodesign Institute. Stephen Johnston is director of the Biodesign Center for Innovations in Medicine at ASU. Johnston demonstrated some of his innovations and inventions to better detect cancer. Johnston also gave Dorothy Foundation guests a tour of his Biodesign laboratory. Local sportscaster Jude LaCava started the Dorothy Foundation with his sister to honor their mother, who died of breast cancer at age 49. Sandra LaCava, executive director of the Dorothy Foundation, spoke at the event Friday. Kerri Robinson, senior director of the Biodesign Institute, welcomed the Dorothy Foundation on Friday. Eric Spicer, senior director of development at the ASU Foundation, thanked the Dorothy Foundation for its support. “We’re forced to spend these long hours with people, some of whom we may not like very much, and that is stressful,” said Vincent Waldron, Arizona State University intergenerational communications professor. So we’ve compiled some intergenerational complaints and probing questions you might hear at the table and given an ASU expert the chance to give you some talking points to keep the peace and understand your family more. It’s not nosiness per se but a biologically driven question, according to evolutionary biologist Michael Angilletta. “There’s this thing called parent-offspring conflict where offspring just want parents to keep taking care of them as much as possible and parents want to be able to take care of more than just one child and then take care of themselves,” he said. There can be a generational gap in technology, but it’s important to remember that technology isn’t inherently a smartphone, but even a wheel or lever, according to historian Christopher Jones. “The grandparents of boomers grew up in a world with little plumbing, no electricity and almost never traveled faster than the pace of walking, but their grandkids flew in planes, drove in cars, lived in electrified homes with good plumbing,” Jones said. “It’s a recurrent pattern that people assume they are living through radical technological innovation of the types not seen before. “Put your cellphone away and allow room for the cranberry sauce instead,” Randall advised. Much like boomers can’t retire like their parents’ generation, many younger Gen Xers and millennials don’t have the same relationship with work their parents did, according to Pamela Stewart, a senior lecturer in history and Osher Lifelong Learning Institute lecturer. “Part of the reason a younger generation is looking for that satisfaction and not only a paycheck is that to some degree they observed people that they thought had stable jobs lose them,” she said. It took until the Renaissance for dictionaries with prescribed spellings and usage to appear, said linguistics professor Elly Van Gelderen. And some historical texts, such as the 15th-century Paston family letters, are as hard to read as some of your children’s texts. In that context, van Gelderen suggests that a little textual ambiguity shouldn’t be painted as the demise of grammar and spelling. It’s not just the latest generation that’s self-obsessed. Art historian Corine Schleif points out that middle class and wealthy patrons painted themselves into the foreground of pictures of salvation history, including the birth of Christ or the Crucifixion. So if a friend takes a picture of herself in an important place, Schleif said she can relate to that in a different way than if she were just to open a magazine or look on the internet for a picture. They might be hard to deal with and Thanksgiving might be all the time you’d like to spend with family, but for computational biologist Melissa Wilson Sayres — who works on interpreting DNA — family is as much based in our real-life relationships as our genetic ones. Top photo: Holiday postcard from 1914. Images courtesy of The New York Public Library Digital Collections, wikimedia and publicdomainpictures.net.